I am experimenting with the NotesList sample program in the Android SDK. I've made a slight variation in the program, but when I install my edited version I keep getting the message INSTALL_FAILED_CONFLICTING_PROVIDER in the console when I try to install it when the original notes program is already on the device. What do I need to change in the Provider to make it a unique database? It works fine if I uninstall the original notes program and then install my edited version. If you are using Google Maps + Google Play Services inside a library project (especially if you recently migrated from Eclipse to Android Studio), you can encounter this error when you try to run an app that uses your library, while a different app that uses the same library is already installed on your device. I would recommend using the package name of the specific app. With this fix, the provider names will no longer conflict, and your app will run as expected. 1.) Your users are seeing the dreaded "-505" install error when installing your app from the Play Store. This can also happen when you have an older version of your app installed and made changes to the (support) library or the manifest file. Deleting the old applications from your device (Settings --> Application --> <your application> --> Uninstall) will solve the issue then. If you are using the Facebook SDK then the issue might be in the "authorities" value you provide for the Facebook provider. You might need to change the defaultConfig.ApplicationId also as suggested in other answers. The same error may occur after renaming packages. Check the value in string.xml for android:authorities from AndroidManifest.xml. In string.xml the value should be the same as your package name, declared in manifest. Basically this happened with me, when i tried to change the package name of the app. So, in emulator, same app was installed before. When i tried to install app after changing package name, it said, authority already used by older application in device. 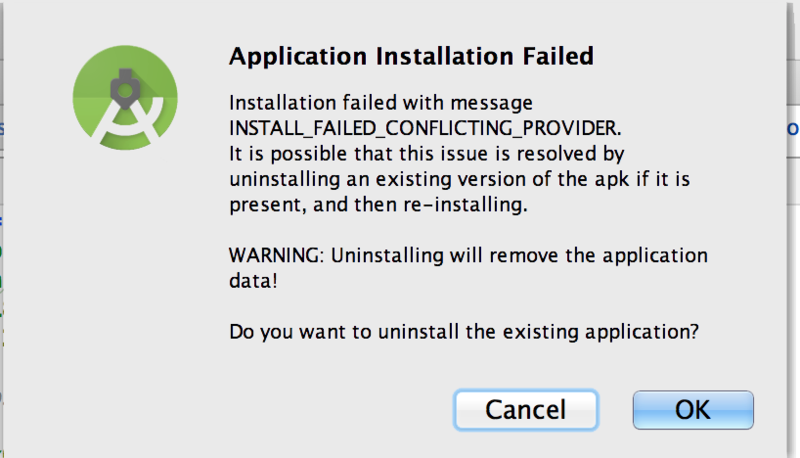 Simply after uninstalling the application, it solved my problem. I had a similar problem when I used one library in several applications. It was necessary just update your AndroidManifest.xml with this exact provider declaration below. 2 - ctrl+f find "provider"
3 - find provider and update your root directory name there. run project. hopefully issue will be fixed! I thought uninstalling the app by dragging its icon to "Uninstall" would solve the problem, but it did not. Select "Uninstall for all users"
Not the answer you're looking for? Browse other questions tagged android android-contentprovider or ask your own question.